The Media Ownership Monitor is an international platform that traces and identifies the owners behind the key media outlets in different countries. 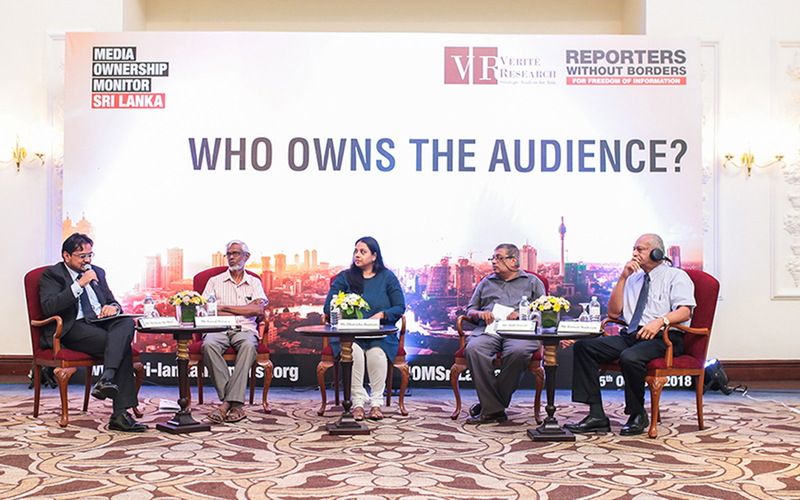 As a pioneering initiative between the German Section of Reporters Without Borders (RSF) and Verité Research, the Media Ownership Monitor platform has been updated to include Sri Lanka, and invites the public to find out, who owns the media outlets in Sri Lanka and how much? Readership, viewership, listenership – what do the numbers tell us? In Sri Lanka, the top four media owners in each medium of television, radio and print account for around 75% of the country’s readership, viewership and listenership. The largest gap in concentration can be seen in the print media, where the leader has 47% of readership. Media outlets are also not free of political affiliations in their ownership structures, with print showing the highest percentage of known political affiliations (79.4%), followed by television (54.8%) and radio (45.59%). The legal framework in Sri Lanka does not provide any specific thresholds or limits on concentration of media ownership. This differs from many comparable countries, such as the Philippines or Turkey, which have regulations designed to encourage competitive, pluralistic media markets. Starting from today, the Media Ownership Monitor Sri Lanka will be available in English, and soon in both Sinhala and Tamil. Anyone navigating through the site can easily access data on the major media outlets, companies, owners, as well as their levels of transparency, commercial connections and political affiliations.